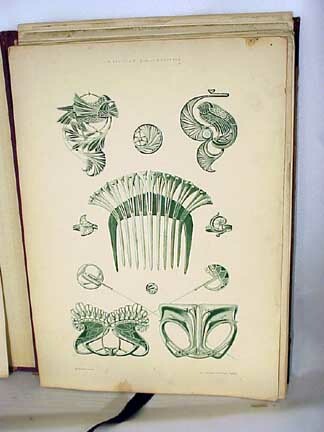 Ephemera from John & Rico's The Drawing Room Antiques and Zsolnay Store of Newport, Rhode Island offering antiques furnishings Biedermeier to Bauhaus; "Neue Ideen Für Modernen Schmuck" "Herausgegeben von René Beauclair" "Im Verein Mit André Petitjean, Jules Armbruster, Paul Liénard, Emile Jammes, Paul F. Follot" "24 Taflen" "Verlag von Jul. Hoffmann Stuttgart"
BK3. 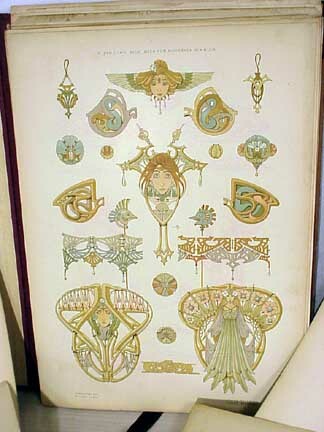 A Secession Era Folio. 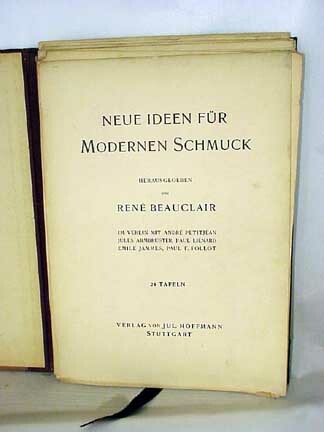 Titled: "Neue Ideen Für Modernen Schmuck" "Herausgegeben von René Beauclair" "Im Verein Mit André Petitjean, Jules Armbruster, Paul Liénard, Emile Jammes, Paul F. Follot" "24 Taflen" "Verlag von Jul. 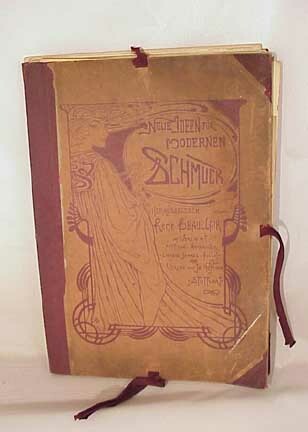 Hoffmann Stuttgart" The previous quoted items are the listing on the interior cover page. inner folio cover stamp: "William Hepburn Importer & Publisher 10 E. 16th Street N.Y." This is a loose leaf folio. I would date this folio around 1905. 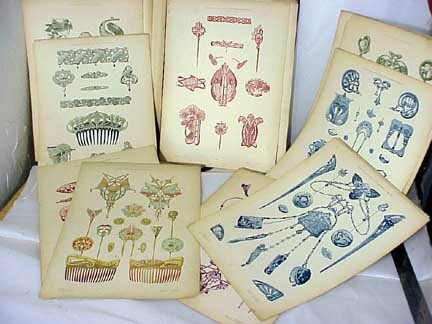 There are 30 either monochrome (one color against cream paper) or polychrome pages. There are some duplicate numbers. I have pictured several. Size of the interior pages: 10" x 13.5"; the exterior folio is slightly larger. Condition: soiled outer cover with a crease mark in the bottom right edge; tying ribbons intact; corner edge creases to many pages and some top edge staining. Price for this collection is: $1,000.00.